This is a companion blog to mycooljob.org, a site designed to give middle-school and early high school students a chance to consider some career choices. Visit my portfolio. We're wrapping up a project to update an entire blog with more usable tags and categories, and I've learned a lot in the process. A little history about this project...the blog we were working on started with a focus on cool technology in general, but has transitioned to a stronger learning technology focus. The old categories didn't really work anymore and tags were inconsistently used. However, at nearly 200 posts, it was time to make to restore information order. To begin, a colleague and I met with one of Ohio State's librarians to talk about categorization and metadata (data about data), and then worked out a plan that would highlight the focus of the blog without overwhelming casual readers. 1. There is no right answer, but there are different approaches for creating categories and tags. We wanted to use our new categories and tags to shape reader expectations and show at a glance what topics are featured. That meant close attention to our choice of words and how to use categories vs. tags. 2. Don't use categories and tags interchangeably. Categories are the "big buckets" that different posts can be put in, while tags are additional keywords that describe each post. To keep the category list manageable, we decided to create a few categories for big concepts and to use tags for specific products, projects, programs, etc. 3. Use tags to connect similar posts. When applying tags, that means focusing on important themes that might be shared in other posts and reviewing past tags to apply them to new posts. 4. Don't be too vague when adding tags. Focus on what make an article unique, rather than using vague terms that apply to nearly everything. Otherwise, tags and categories all blend together. For example, when we first introduced the new system, one writer tagged an article as "information," but since that *should* apply to all posts we removed it and left only tags about the topic of the post. We just finished the recoding, and the difference is striking. There are still some challenges in this project -- mainly that it's hard to bring everyone up to speed about the new guidelines in a shared group blog -- but we'll see how it goes. It's been over a year since I posted to this blog. I have done and learned a whole bunch of new web things in that time, but making time to talk about projects when you're in the middle of them is tough. I've spent the past two days at the Kiplinger Program's KipCamp, an intensive course about social and digital media in communication. I'll be starting the last day of KipCamp in a couple hours and wanted to note a few things I've learned. 2. The point of social media p.r. is less to tell the whole story than to be interesting. Or at least interesting enough that your social network forwards your message to their networks, and so on, and so on... Its strengths are forming a baseline of awareness across a large group. This realization struck when a fellow camper and I were trying to revise a factual "tweet" into something more lively -- neither of us disliked the original version, but we also wouldn't think to forward, or "retweet," it. 3. There's no quick solution to creating an online persona. The people who do it well are adaptive and responsive and probably naturally witty. They pay attention to what works and model what they like in others. 4. Organizations, and even individuals, have online identities whether they create them or not. Products, services, and brands are talked about on social networks. Most individuals are findable either through simple Google searches or searches of the deep web (information databases that haven't previously been widely searchable). If you want a say in what's out there, you have to be out there saying it. 5. Savvy media people build marketing into everything they do. My session of KipCamp is being filmed for a television short on the OHIO network and we're encouraged to tweet about the program to practice what we're learning. 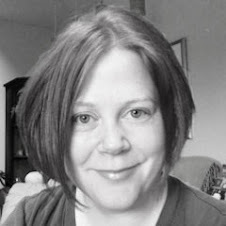 (And here I am on my own time blogging about it!) These things record the experience so other people will choose to attend the program. The media experts who run the program know that it's not enough to do great work if no one else knows it. The "Teach Online" project is now mostly done. 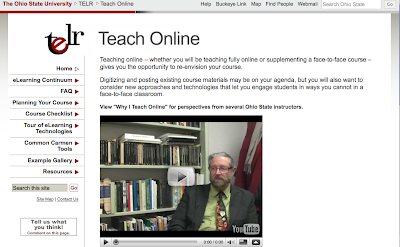 You can visit it at http://telr.osu.edu/teachonline. models our recommended practice of accommodating different learning styles, as some people prefer audio or video to written text. literally shows our target audience that others like them are doing the types of things they want to be doing. This summer as I was working on a freelance book project that required updating screen captures of websites, I noticed another more subtle shift. Although only a year had passed, the featured sites had changed to make room for much more ad placement–-nearly every site had been reworked to show Google ads in multiple places on the page even if the rest of the design was the same. 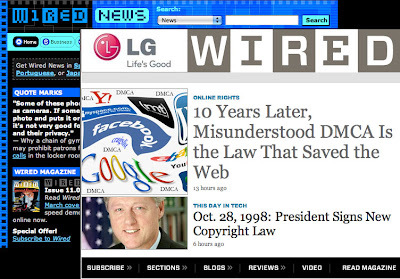 Maybe the big lesson is that web site design, like fashion, is not timeless. Even sites that were the height of cool in their day might end of the web equivalent of a 1970s polyester leisure suit. It will be interesting to see what comes next. The goal of my current web project is to present a lot of information in a non-threatening way. To avoid overwhelming people, I'm trying out some interactive page elements – slideshows that scroll sideways and, hopefully, sections that open and close vertically when clicked. Here's a picture, but you can visit the draft version at http://telr.osu.edu/teachonline/tour.htm to try it. My goal with this design is to encourage people to click to the information that interests them and perhaps read other parts that are within easy reach. The less work it is to move through the content, the more likely our audience will be to learn what we're teaching. I'll keep you posted as this site progresses. Two challenges for web developers (and all technology professionals) are teaching themselves new skills and keeping up to date with current trends. It's for those reasons that I started my personal website, Flora Photographs, about 5 years ago. How do you display web content in languages other than English? The quick answer is to use unicode. Unicode is a standard that includes character representations encompassing all living languages.